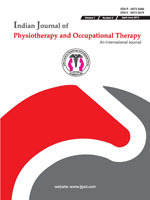 Background: The aim of the study was to find out the best predictors of job satisfaction and to investigate the level of job satisfaction among physiotherapists. Method: A self-administrated questionnaire survey was conducted in December 2008. Data were collected from 196 physiotherapists in government and private health care settings, institutions located in northern regions of India. The response rate was 77.55%. Results: 72 women (51.43%) and 68 men (48.57%) participated in the study. The percentage of satisfied physiotherapists was 56.4%. Logistic regression analysis showed that the most important predictors of job satisfaction were: (1) Salary (OR=3.694, 95% CI 2.340-5.832), (2) Interesting (OR=1.937, 95% CI 1.009-3.719), (3) Fulfilling (OR=1.679, 95% CI 0.009-2.835). Job satisfaction dimensions indicate that highest dissatisfaction levels occur in the area of salary and job security. The percentage of satisfaction ratings was higher in men (65.3%) than in women (47.1%). Post graduate professionals were found to be more satisfied (70.7%) as compared to their graduate counterparts. Conclusion: This study concludes that salary, interest in work and fulfillment in job are important predictors of job satisfaction among physiotherapy professionals. The result shows that a total of 79 (56.4%) physiotherapists were globally satisfied with their job. The percentage of satisfaction ratings was higher in men (65.3%) than in women (47.1%). Adetoyeje Y. Oyeyemi. Nigerian Physical Therapists’ Job Satisfaction: A Nigeria - U.S.A. Comparison APTA, VA 2231-1488, 1989. Barnes D.S., Job Satisfaction and Rehabilitation Professionals, Administration and Management Quarterly AOTA, 14 (4), 1998, pp.12. Barnes M.R., and C.A. Crutchfield, Job Satisfaction-Dissatisfaction: A Comparison of Private Practitioners and Organizational Physical Therapists, Physical Therapy 5: 1997, pp. 35 41. Bowran J, Todd K. Job stressors and job satisfaction in a major metropolitan public EMS service. Prehospital and Disaster Medicine 1999;14(4):236-9. Bronski D.C., and S. Cook, The Job Satisfaction of Allied Health Professionals, Journal of Allied Health 7: 1994, pp. 281-287. Buchbinder RN, Wilson M. Primary care physician job satisfaction and turnover. Amer Jour of Managed Care 2001;7(7):701-13. Calnan M, Wainwright C. Mental health and stress in the workplace; the case of general practice in the UK. Soc Sci Med 2001;52:499-507. Firth-Cozens J. Individual and organizational predictors of depression. Br Jour Gen Prac 1999;48:1647-51. Huby G, Gerry M, et al. Morale among general practitioners: qualitative study exploring relations between partnership arrangements, personal style, and work load. BMJ 2002;325:140. Karasek RA, Theorell T. Stress, Productivity, and the Reconstruction of Working Life. New York: Basic Books, 1990. Migle Gamperiene et al. ,Self-reported work ability of Norwegian women in relation to physical and mental health, and to the work environment : J Occup Med Toxicol. 2008; 3: 8. Okerlund V.W., et al, “Factors Affecting Recruitment of Physical Therapy Personnel in Utah,” Physical Therapy 74 (2), 1994, pp.177-184. Published online 2008 April 22. doi: 10.1186/1745- 6673-3-8. Rozier, C.K., et al, “Gender and Physical Therapy Career Success Factors,” Physical Therapy 78: 1998, pp. 690-704. Semmer N, et al. Instrument for Stress-related Job Analysis (ISTA) (Version 6.0). Sibbald B, Enzer I,et al. GP job satisfaction in 1987, 1990 and 1998: Fam Prac 2000;17:364-71. Speakman, C.B., et al, “The Job Satisfaction of Physical Therapists,” Physiotherapy Research International 1 (4), 1996, pp. 247-254. Y Seo,et al: The determinants of job satisfaction among hospital nurses: a model estimation in Korea. Int J Nurs Stud 41, 437–446 (2004).